Flo’s V8 Cafe is a quick-service restaurant in Disney California Adventure. 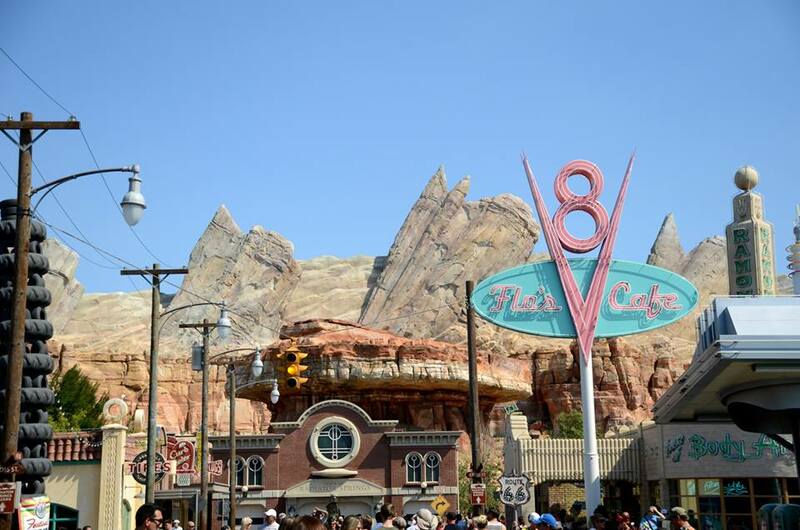 Located in Cars Land, Flo’s is what ties the area together. 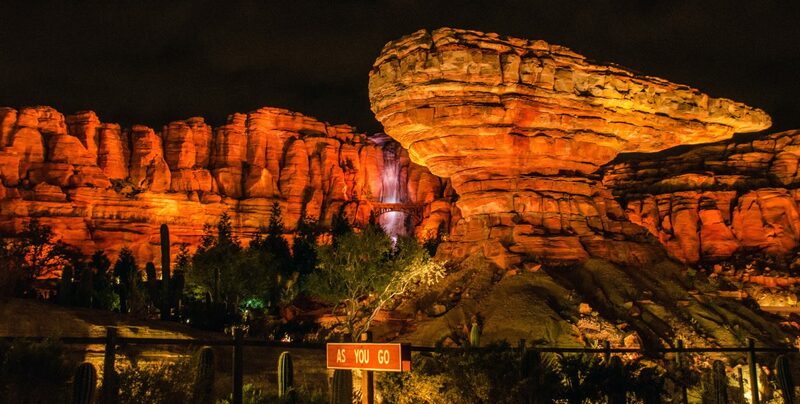 Adorned in neon lights in the evening and bright colors through the day, Flo’s is one of the first things eyes are drawn to when entering Cars Land. 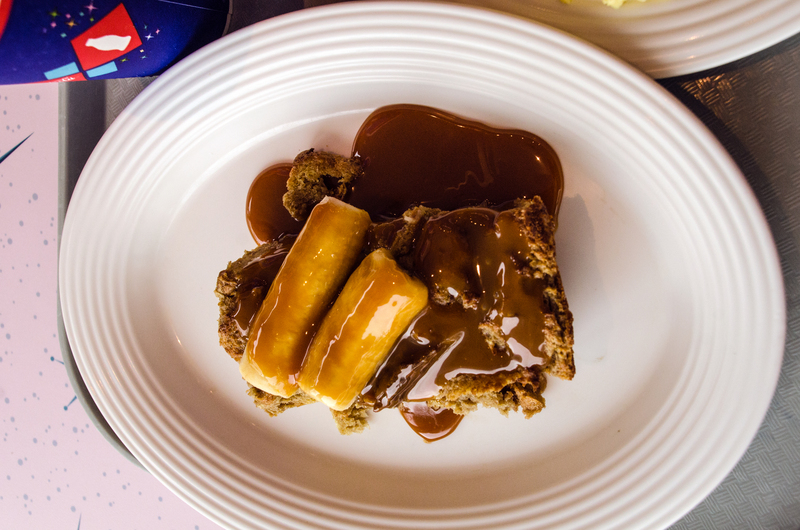 Flo’s serves American comfort and southwestern food. On our latest trip to Flo’s we went for breakfast. Quick-service restaurants aren’t often known for their breakfasts. For whatever reason, Disney (and other theme parks) haven’t quite figured out how to offer good food at these counter service places. Instead, these places usually offer rubber scrambled eggs, mushy potatoes, and sausage that you don’t entirely trust. Most counter-service restaurants don’t offer inspired and original menus either, it’s just the same everywhere you go. Does Flo’s break that trend? I think for the most part, the answer is yes. As you can see from this menu, there are four adult entrée options for breakfast. Two of those, the Brioche French Toast and the Chicken Tamale Breakfast, are not your standard counter-service fare. The other two options are fine, being a standard breakfast plate (bacon, eggs and the like) and a fruit plate with yogurt. Those are typical choices at quick-service restaurants, but I don’t mind having a few standard dishes as long as there are unique options on the menu. We went to Flo’s and ordered at the counter. There was hardly anyone in there, which I don’t quite understand. I get that many people like Starbucks or eat in their hotel room but most guests will settle for those standard breakfast choices that I mentioned up above. Needless to say, that is why more original choices aren’t offered at different locations. Why serve it if there is no demand? I digress, it was nice to have one of the funnest restaurants in the Disneyland Resort to ourselves. 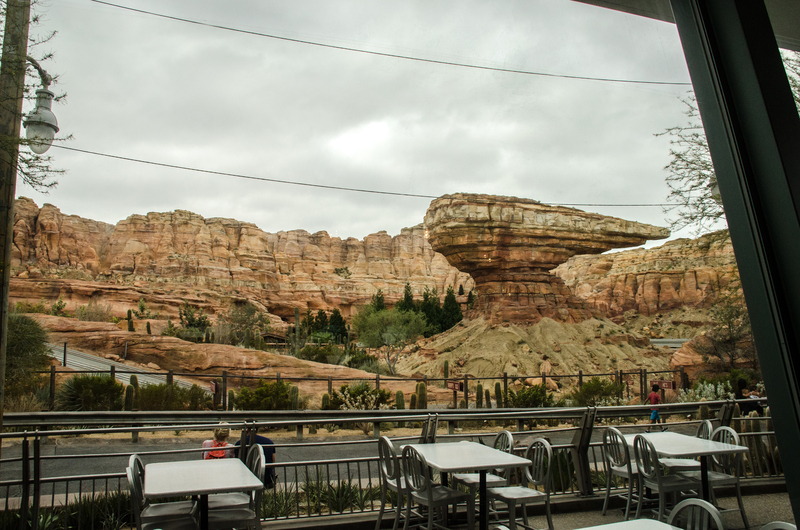 We sat indoors but by the big windows facing Radiator Springs Racers. We had an incredibly peaceful meal and the wait staff there was very attentive, although that might have had to do with us being the only people in there. Melissa ordered the Brioche French Toast and enjoyed it. I had a taste too and thought that it was moist and not overly heavy. I liked the caramel sauce, but was also happy that the toast wasn’t drenched in it. The bananas served with it were a nice touch and augmented the taste of the toast. Melissa said that she usually gets tired of dishes like this about halfway through, due to the sweetness and how dense the french toast is, but this dish was much better than the usual Brioche French Toast and she had no trouble finishing it all. I ordered the Chicken Tamale Breakfast and am still unsure of how I feel about it, three months later. First of all, I commend Flo’s for an ambitious dish. 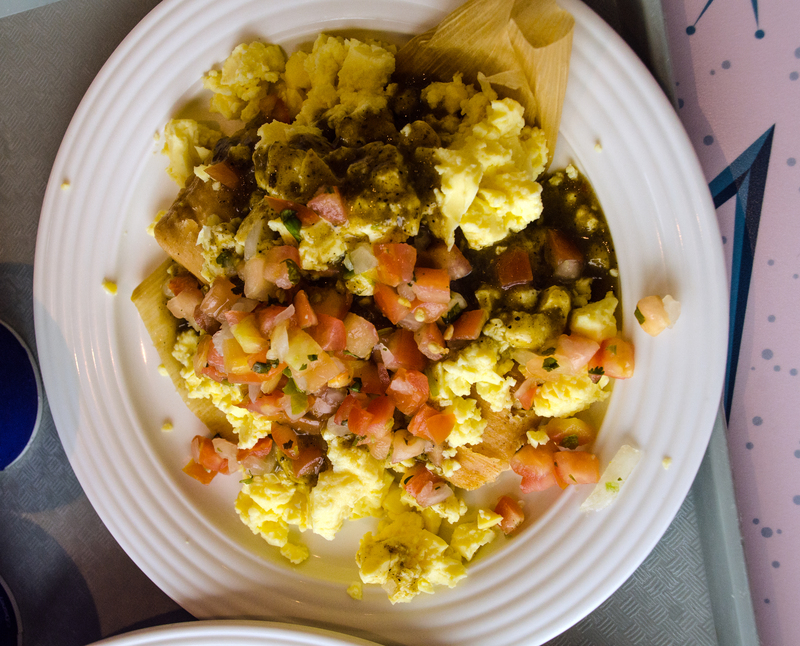 I really enjoyed the idea behind the dish, with a chicken tamale on scrambled eggs, topped with a salsa verde. It was the individual components of the dish that may have let me know some. I thought the chicken in the tamale lacked flavor and didn’t taste extremely fresh. The eggs were better than usual counter-service eggs but still not enough to make me think highly of them. The salsa was my favorite part of the dish and may have helped to hide some of the other weaknesses. Overall, I thought the dish was decent but could have been more. 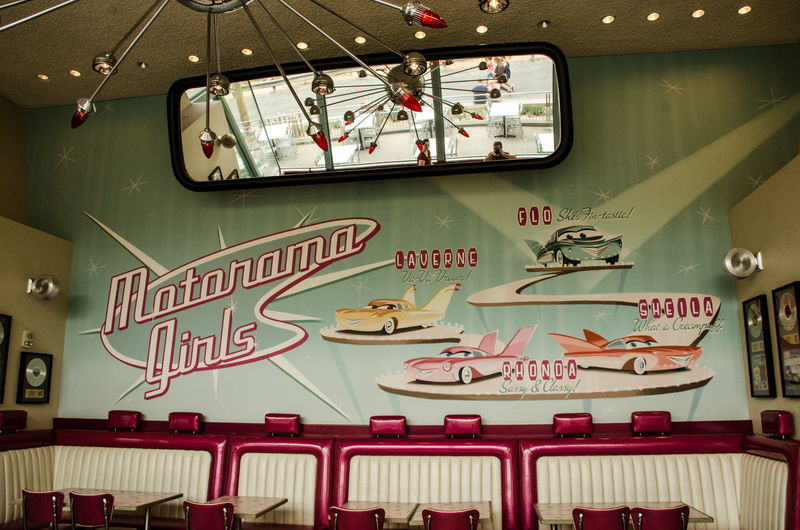 Flo’s is a great place for any meal simply because of its location and theming. Each room is decorated differently and has some great gags to look at. The room we sat in had records up on the wall based on fake bands. 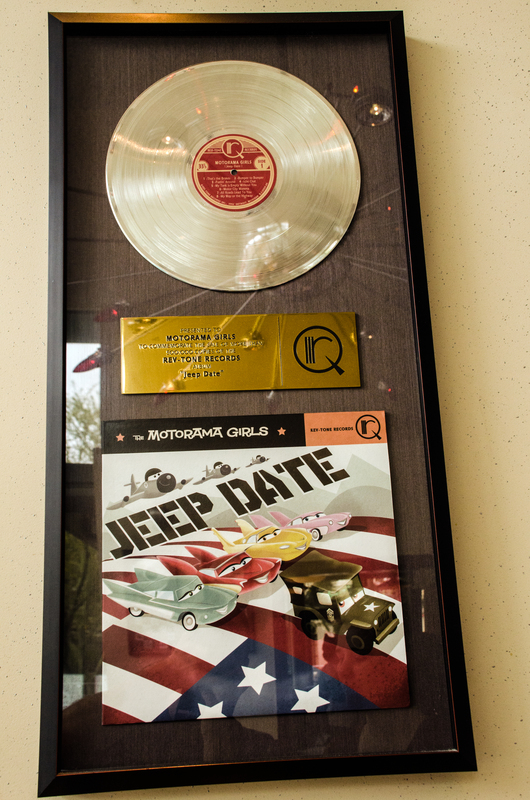 All of these band names were based on real bands but were filled with car puns. They were all interesting and fun to look at. Overall, I think there are a lot of reasons to visit Flo’s for breakfast. There is a break from all of the crowds, the restaurant has great theming and offers fun views, and the menu is interesting. Could the food be better? Of course. I would also like to see them expand the menu. But, Flo’s was still very fun and a place I’d recommend. It’s much better than your standard counter-service breakfast.